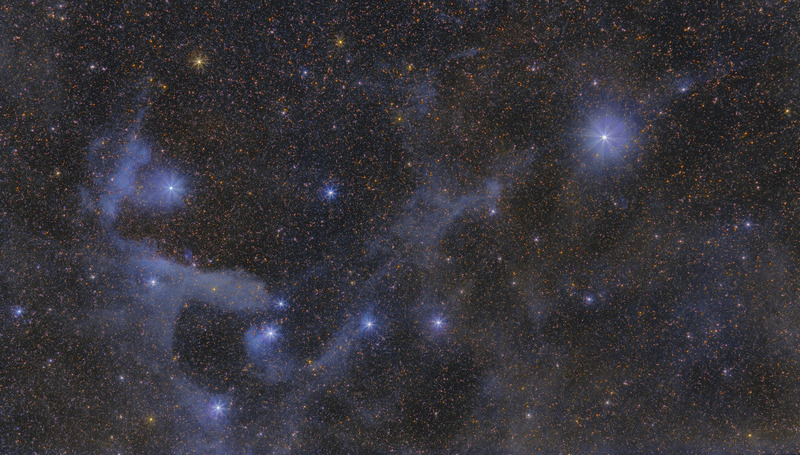 This image shows a faint reflection nebula known as Vdb 99. The nebula shines from dust that is reflecting light from bright and hot blue stars. This object is another one of the overlooked nebulae that is outshined by its celestial neighbor, Rho Ophiuchi. Software Used Images Plus 5.0 for camera control, calibration, stacking, digital development, ArcSinH stretching, star shrinking and halo reduction, smoothing and noise reduction. Photoshop CS5 used for levels and curves, high pass filter, star shrinking, screen mask invert, lab color, vibrance, saturation adjustments, and selective color. HLVG for additional color correction, Gradient Xterminator for gradient removal. Carboni Tools for additional noise reduction, and smoothing. Registar for aligning stacks and for color channel alignment. Notes This is such an uncommonly photographed region of the sky, its hard for me to judge how well or poorly I've done with it. The nebula is quite subtle, so I was glad to be able to capture any of it! This image was published by Astronomy Magazine as its Picture of the Day for February 27, 2015!